In 1983, in Washington, D.C., The Salvation Army through a network of churches organized a mobile feeding canteen to meet the basic needs of a growing street homeless population. Grate Patrol was named for the heating grates where many homeless congregate. Today, The Salvation Army offers support to the homeless and hungry thanks to help from dedicated volunteers from 24 local churches and other organizations. 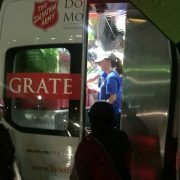 Grate Patrol serves approximately 120-150 evening meals every night of the year. The Salvation Army employs two drivers and a full-time Outreach Coordinator who provides material assistance such as blankets, hats, gloves, hygiene kits, work boots, coats, and other resources. The “Fresh Start” hygiene kit in which we supply basic needs such as body soap, washcloths, toothbrush and toothpaste, shampoo, disposable razors, hand sanitizers or wipes and first aid items. While dispensing meals provides a foundation of trust and respect, food alone does not begin to address the root problems and factors contributing to living on the streets. Grate Patrol’s Outreach Coordinator maintains an active caseload to help clients meet basic needs as well as establishing long-term goals to help break the cycle of homelessness. This includes providing help to complete applications for housing, Social Security benefits, veterans’ benefits, medical care, and substance abuse treatment and rehabilitation services. In instances where The Salvation Army cannot provide the necessary service, Grate Patrol clients are referred to other service providers, often for substance abuse treatment and permanent supportive housing placements. Volunteers are always needed. To become a Grate Patrol volunteer, please complete the sign-up form.